There have been many new hires and promotions in the past few months. Congratulations to all! Daniela Solomon was hired as Research Librarian 2 for Research Services on July 2, 2012. Patrick Feeley was hired as Analyst Programmer 2 for Scholarly Resources & Special Collections on July 16, 2012. Cheryl Seme was promoted to Librarian 1 for Digital and Learning Services on August 20, 2012. Carl Mariani was hired as Library Assistant 4 for Access and Delivery Services on August 27, 2012. Suzhen Chen was promoted to Librarian 2 for Acquisitions and Metadata Services on October 1, 2012. Stephanie Church was promoted to Librarian 2 for Acquisitions and Metadata Services on October 1, 2012. Elanor Drushel was hired as Library Assistant 3 for Access and Delivery Services on October 8, 2012. W. Eric Bassett was hired as Library Assistant 3 for Access and Delivery Services on October 15, 2012. Shannon Robinson joined our staff as Fine Arts Liaison Librarian on September 10th. Shannon received her B.A. from Montclair State University in 2002, an M.F.A. from Tyler School of Art of Temple University in 2006 and her M.S. in Library and Information Science from Drexel University. The Kent State University Libraries’ Department of Special Collections and Archives is pleased to announce the appointment of Penny White and Stephen M. Krason II as the 2012-2013 Dr. Gerald H. and Victoria C. T. Read Graduate Assistants. Ms. White is a 2009 graduate of Wright State University, with a degree in art history. Her prior experience includes work as a graduate student assistant in Special Collections and Archives, significant retail experience, as well as two positions with the Dayton Art Institute as a summer art camp teacher and an education department intern. She is completing her second year in the School of Library and Information Science (SLIS) Master’s program. Mr. Krason began his SLIS graduate studies this fall. He is a 2009 graduate of Franciscan University of Steubenville, Ohio, with a double major in history and communication arts. He has held prior positions as a research intern for the Institute of World Politics in Washington, DC, as an interlibrary loan assistant, and was most recently Production Technician/Creative Services at WTOV-TV 9 in Steubenville. A program of the Kent State University Libraries, the assistantship is funded by a generous donation from the Dr. Gerald H. and Victoria C. T. Read family and is intended to provide intensive pre-professional experience in special collections and archives to Master’s level library and information science students at Kent State University. OLSSI has announced that it will hold its 12th annual conference July 28 – 30, 2013 at Heidelberg University in Tiffin, Ohio. 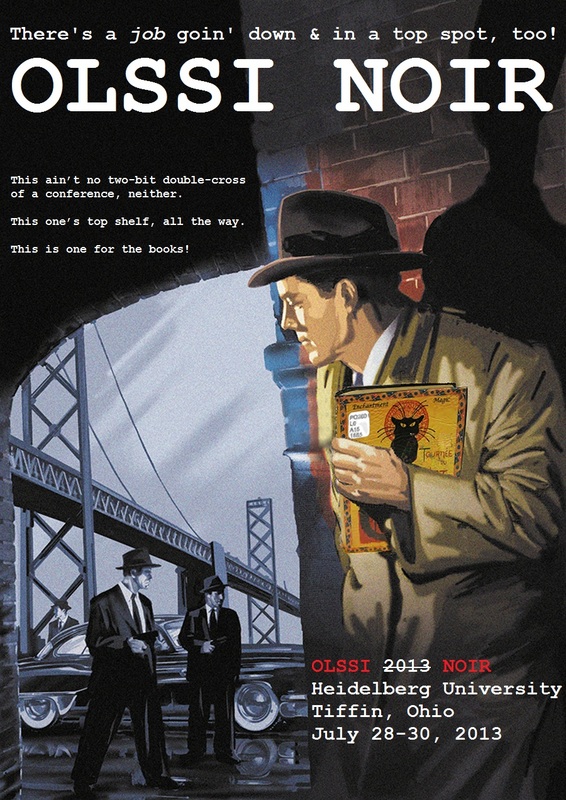 OLSSI 2013 will have a “mystery/noir” theme. Betsy Blankenship was recognized at a luncheon on November 14, 2012 for 25 years of service by The Ohio State University Libraries and will be recognized by The Ohio State University on December 13, 2012. She has served at the Marion campus for all 25 years. Pat Wood will begin covering Academic KnowItNow chat service shifts in January 2013. In November 2012, Ben Daigle joined OWU Libraries in a newly created position­­—Discovery Services Librarian. Ben is responsible for helping users more efficiently and effectively uncover and connect information for their varying research needs. Ben received an MLIS from Kent State University in 2009 and a BA in English from Temple University in Philadelphia. You can connect to Ben via email at bldaigle@owu.edu. In July 2012, Melissa Hill joined the OWU Libraries staff as Serials and Government Documents Manager. She has responsibility for managing print and microfilm subscriptions, and assisting in the acquisition of electronic journals and journal databases, along with managing and processing government documents. She earned Bachelor’s degrees in diplomacy and foreign affairs and in international studies from Miami University and an MLIS from Kent State University. You can connect to Melissa at mkhill@owu.edu. Haley Kuhn is the new Circulation Manager at the OWU Libraries. Haley has steadily taken on more responsibilities and has, for a couple of years, managed personnel, overseen daily circulation procedures and workflows, and created user-centered processes and services. Haley earned a BS in Computer Information Management from Ohio Dominican University and an MLIS from Kent State University. You can connect to Haley at hakuhn@owu.edu.